You only have to take one step inside Chinatown's Far East Plaza to know that this food hall is on fire right now. The opening of Howlin' Ray's, Amboy, Unit 120, Endorffeine and more have made the destination a lunchtime paradise—if you're willing to wait in line, that is. If you haven't made it here yet, there's a ton of cool stuff happening in the near future that you'll want to check out. Tonight: It's like our Panda Express and fried chicken dreams just came true. Golden Boys Chinese, the latest concept to post up at Alvin Cailan's culinary incubator Unit 120, is offering a crispy orange chicken sandwich tonight only, available at the Amboy takeout window from 4-10pm. 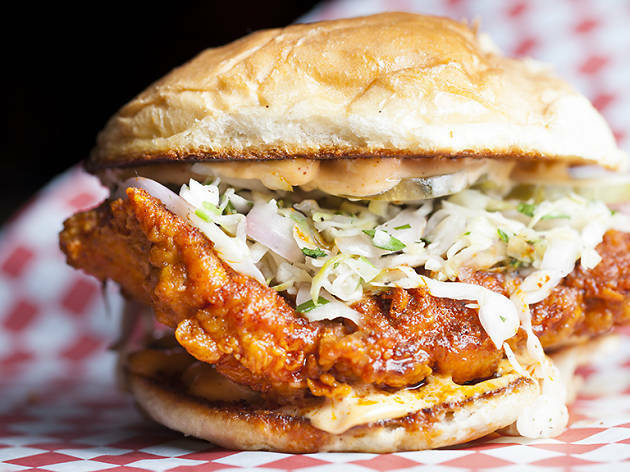 It's $10, it's topped with Sichuan tiger slaw and smashed cucumbers, and it sounds goddamn delicious. This weekend: Endorffeine, Far East Plaza's new-ish coffee shop, offers a series of dessert tasting events called "9," where dessert courses are paired with coffee cocktails in an intimate setting (there are—you guessed it—nine guests). This Saturday, they're debuting their brand new summer edition. Think: market fruit sushi and fried mung beans paired with coffee blossom sake, or milo chocolate sangkaya with Japanese milk bread paired with a sparkling cascara IPA. Head to Endorffeine's website to sign up for the event. Next month: That Howlin' Ray's line, though. 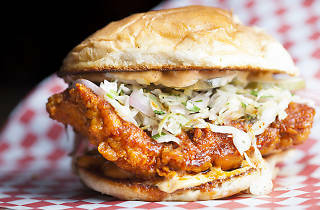 If you don't work or live anywhere near the Nashville hot chicken shop, it can take a huge chunk out of your day to drive out here and wait for one of their sandwiches. Good news: on August 4 and 18, Howlin' Ray's will be extending their hours until 8pm for their first dinner service. We'll be there—will you?